Vee is on day 3 of bein’ sick. Stop it, sicko! great comic. A hearty chuckle midway through the day is always needed. You provide a valuable service. Hey! Is this the first ever Channel Ate webcomic post to have a remotely good thing happening?! Yeah, that is kinda funny. I’m not sure I can think of another one. . .
Edgar Allen Poe: the early days. Just stumbled upon your comic today… and effectively wasted an hour at work reading your entire archive. Love it! Awesome! thanks for reading! Hopefully it’s an addiction that can’t be cured with a patch. Very funny. . . very cute. I like. 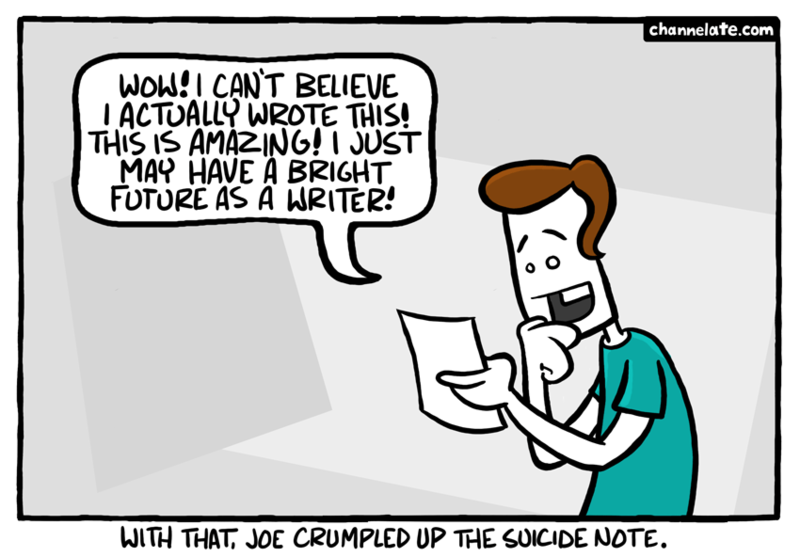 DUDE I DID THE SAME THING WITH MY SUICIDE NOTE! Except i eventually killed myself. hey i just started reading your strips and they’re great! Hey moomoohk, if you look at the URL it has the date up there 2009/09/30 and if you type that in after the channelate.com it will take you straight to that specific comic without the title in archive form, then just click it to go to the explorer form. And being that I won’t comment for a while, I love your comics, man! Very funny and relaxing. Your style is unique in comparison to other people I have read stuff from. Thanks for posting when you have the opportunity, Guess I will just bookmark this blog. VEdGxC Oakley dIspatch Sunglasses Appreciation to my father who shared with me regarding this webpage, this web site is in fact awesome. There is definately a great deal to find out about this topic. I love all the points you made. Really enjoyed this blog post.Really thank you! Great. Thanks for sharing, this is a fantastic blog post.Much thanks again. Really informative blog post.Really looking forward to read more. Awesome. SAC LANCEL PAS CHER ??????30????????????????5??????????????? | ???????? That as a great post. Thank you so much. It’? ?s actually a nice and useful piece of info. I’? ?m happy that you simply shared this helpful info with us. Please keep us up to date like this. Thanks for sharing. This unique blog is really educating and besides diverting. I have discovered a lot of handy advices out of this amazing blog. I ad love to return again soon. Thanks a bunch! or even I achievement you get right of entry to constantly quickly. What a funny blog! I truly loved watching this humorous video with my family unit as well as with my friends. Major thankies for the blog article.Much thanks again. Really Cool. Thanks for sharing, this is a fantastic article.Thanks Again. Much obliged. Keep up the good piece of work, I read few content on this site and I conceive that your weblog is rattling interesting and holds lots of great info. It as really a cool and helpful piece of info. I am glad that you shared this useful information with us. Please keep us up to date like this. Thanks for sharing. Wow, this piece of writing is good, my sister is analyzing such things, so I am going to let know her. Louis Vuitton Artsy Bag ??????30????????????????5??????????????? | ???????? My spouse and I stumbled over here from a different page and thought I should check things out. I like what I see so now i am following you. Look forward to looking over your web page again. I truly appreciate this post.Much thanks again. There are certainly a couple extra fine points to engage into consideration, but thankfulness for sharing this info. Perfect just what I was looking for!. Wow! This can be one particular of the most beneficial blogs We ave ever arrive across on this subject. Basically Excellent. I am also an expert in this topic so I can understand your effort. Perfect work you have done, this site is really cool with wonderful information. This web site certainly has all the information I wanted concerning this subject and didn at know who to ask. YkdYpi Really informative blog article.Really looking forward to read more. What as up, I log on to your blogs on a regular basis. Your humoristic style is awesome, keep it up! Only a smiling visitor here to share the love (:, btw great pattern. ?????? Everything should be made as simple as possible, but not one bit simpler.?? ???? by Albert Einstein. This is a topic that is close to my heart Best wishes! Where are your contact details though? You completed several fine points there. I did a search on the theme and found mainly persons will have the same opinion with your blog.